This creamy coconut sauce made with peanuts, ginger, and lemongrass is on-trend and delicious. ginger root, peeled, minced	 2 tbsp. 1. Cook sesame oil, ginger, garlic, lemongrass paste and curry powder in a saucepan on medium heat for 2 minutes, stirring constantly. unsweetened coconut milk	 27 oz. 2. Turn heat to medium-high. Add in peanuts, soy sauce, hoisin sauce, fish sauce and coconut milk. 3. 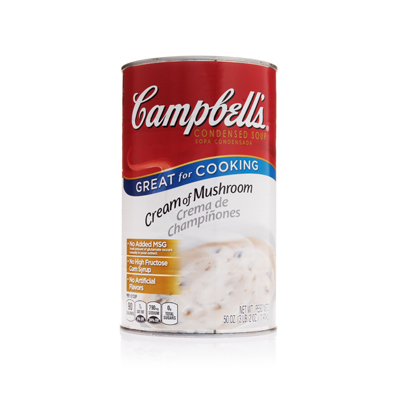 When mixture is warm, add Campbells® Cream of Mushroom Condensed Soup and water. Bring to a boil then reduce heat to a simmer for 10 minutes. 4. Blend sauce until smooth. 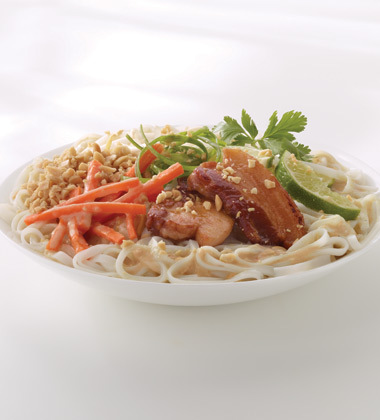 May use fresh lemongrass instead of lemongrass paste. Simply dice and put it in cheesecloth. Remove before blending. Add heat with cayenne pepper, chipotle, or a diced jalapeno.